Krypton! What a fascinating element! 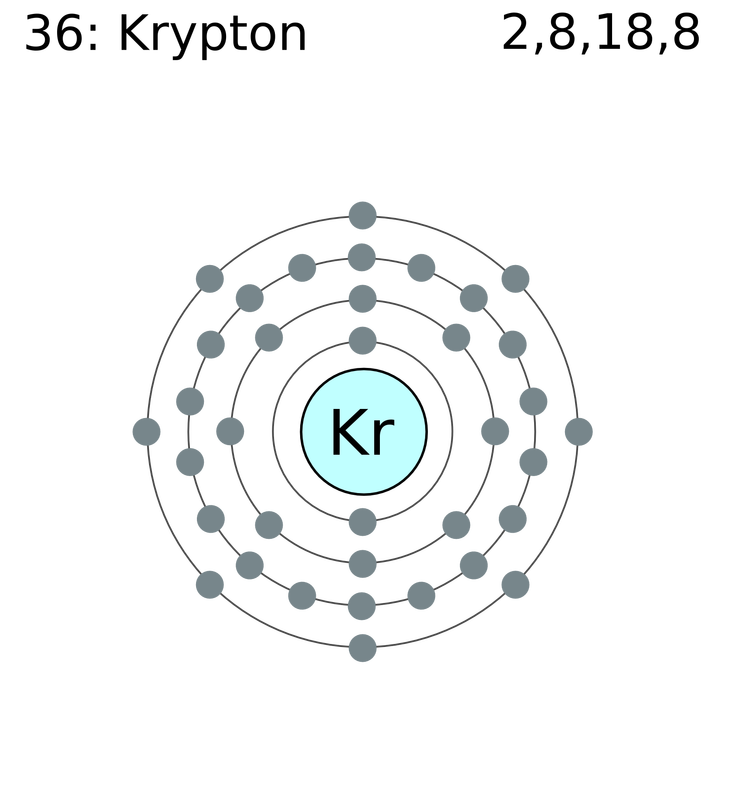 As a member of the member of the noble, or inert, gases, it is located period 4 and family 18 on the Periodic Table of Elements, it’s symbol is Kr, it’s atomic number is 36, it has 36 electrons and protons, and it has 48 neutrons. At 83.8 atomic mass units, Krypton is a colorless and odorless gas. The atomic radius of Krypton is 88pm. In 1898, two members in the noble gas family of the Periodic Table of Elements had been discovered so far, helium and argon. At this point, no other elements had been discovered in this family. William Ramsay and Morris M. Travers were investigating the missing spaces. Since the other two elements were gasses, they theorized that maybe the others were gases as well. Ramsey and Travers thought that the maybe one of the missing elements could be found in air. But air had already been categorized as 99.95% oxygen, nitrogen, and argon, along with some other gases. Perhaps the missing gasses were in that last 0.05%? The answer could be found in liquid air. To get liquid air, you have to cool air- a lot. The colder air becomes, the more gases in the air become liquids. At -182.96°C (-297.33°F), oxygen turns from a gas into a liquid. At -195.79°C (-320.42°F), nitrogen turns from a gas to a liquid. So if you cool the air enough, then you can liquify all of its components. The opposite can also take place; air can also be heated. But what Ramsey and Travers were doing was very difficult; they were looking for a minuscule bit of krypton in the air. Krypton is 0.000114% of air, so in every 100 liters of air, there would only be about 0.00011%. (In 100 liters of air, there would be about one drop ok krypton.) So, the name “krypton” was derived from the Greek word kryptos, or “hidden”. The date of the discovery was May 30, 1898. Krypton is not that abundant in the earth; the percent of krypton in the earth’s crust is 1.5×10-8%. The estimated crustal abundance is 1×10-4 milligrams per kilogram, and the oceanic abundance is 2.1×10-4 milligrams per liter. That is not a lot of krypton! There are not really many uses for krypton due to the high price of obtaining it. Krypton is used for photographic flashes used in high-speed photography. 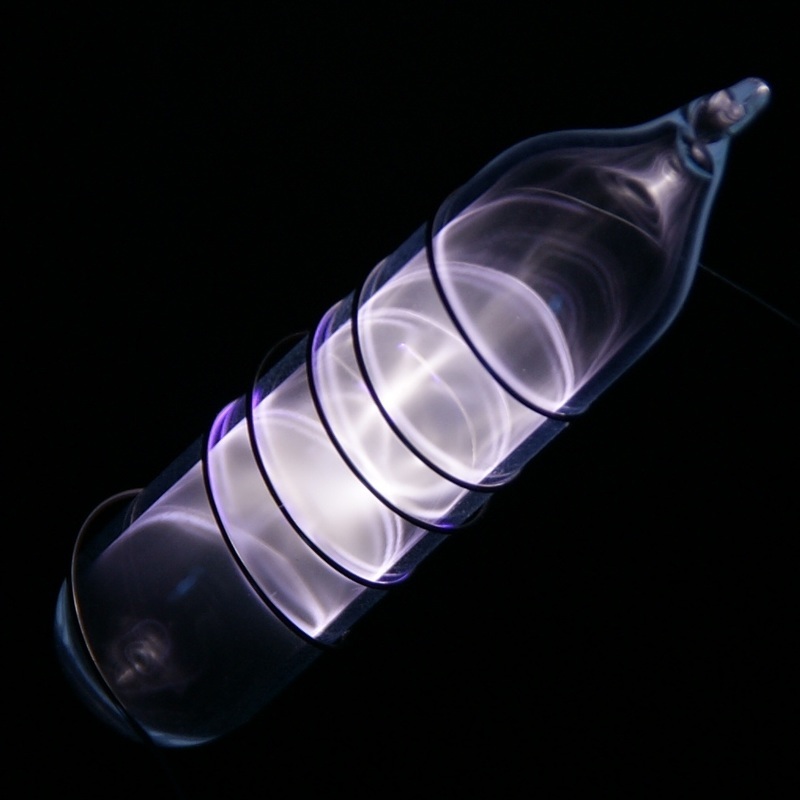 In some fluorescent light bulbs, argon and krypton are mixed together to emit light. Krypton can be combined with other gases that make luminous signs to emit a greenish-yellow light. Krypton is also used in energy-saving fluorescent lightbulbs. Krypton does not react with air or water. However, it does dissolve a tiny bit (59.4 cm3 kg-1), at 20º Celsius (293 Kelvin). If krypton is bonded with fluorine (F2), cooled to the temperature of -196º Celsius (also the temperature at which nitrogen boils), and is shot with a discharge of electric x-rays, then something really interesting happens: a formation of difluoride krypton(II) fluoride (KrF2). The resulting compound decomposes at room to warming temperatures. Other halogens do not react with krypton. Since it is a noble gas, it does not react at all. The reason for this is because it has eight valence electrons, so krypton doesn’t need to receive any more, therefore, it has no need to react. Some compounds of krypton include: krypton tetrachloride, formula: KrCI4, molar mass: 225.61. Krypton difluoride, formula: KrF2, molar mass: 121.7948. Krypton hexabromine, formula: KrBr6, molar mass: 563.222. Krypton dichromate, formula: Kr2Cr2O7, molar mass: 383.584. Krypton chromate, formula: KrCrO4, molar mass: 199.7917. Krypton tetrafluoride, formula: KrF4, molar mass: 159.7916128. Krypton dioxide, formula: KrO2, molar mass: 115.7968. The lights that power runways at the airport and that are on airplanes are powered by krypton. 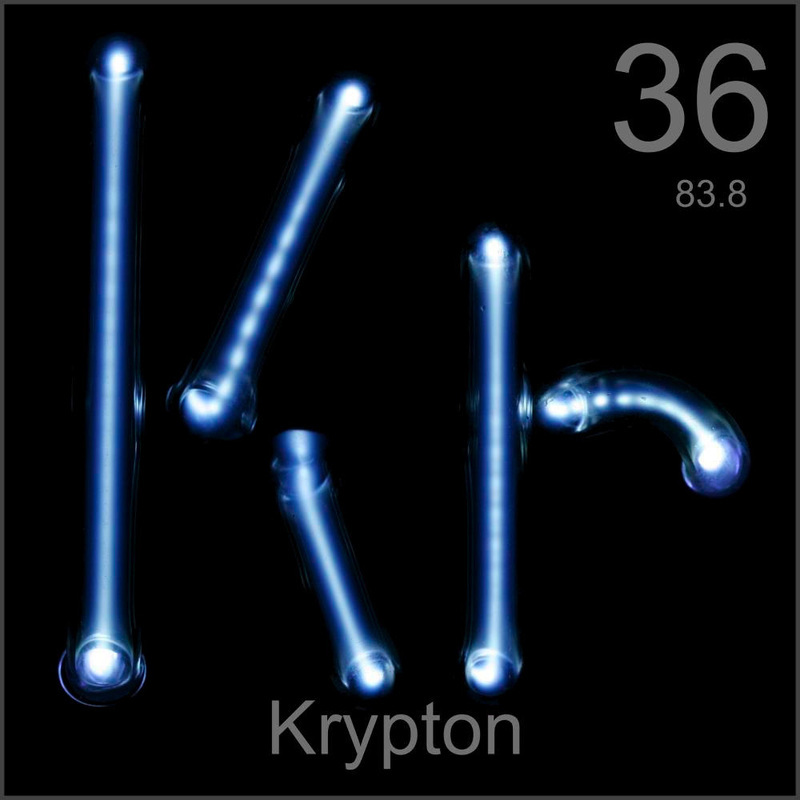 Krypton is one of the rarest gases in earth’s atmosphere (1/1,000,000).When krypton is used in lightbulbs, it emits a blue-white glow. Ramsey and Travers also discovered xenon and neon, other noble gases, weeks later. “Element 36 - Krypton - Science Notes and Projects.” Science Notes and Projects. Wordpress, 31 May 2013. Web. 22 Jan. 2015. Lim, Nathaniel. "Supergas: Gas of Air (The Story of Krypton)." Yet To Be Told. N.p., 10 Aug. 2011. Web. 17 Oct. 2015. Bentor, Yinon. "Chemical Elements.com - Krypton (Kr)." Chemical Elements.com. Chemical Elements.com, 1996-2012. Web. 17 Oct. 2015. Gagnon, Steve. "The Element Krypton." It's Elemental -. Jefferson Lab, 2015. Web. 17 Oct. 2015. "Videos of Krypton." Periodic Table. Royal Society of Chemistry, 2015. Web. 17 Oct. 2015. K., Maggie, and Kirsten S. "#36 - Krypton - Kr." The Periodic Table For Students K Through 12. N.p., 2005. Web. 17 Oct. 2015. "Abundance in Earth's Crust of the Elements." Abundance in Earth's Crust For All The Elements In The Periodic Table. Wolfram Research, Inc., 2015. Web. 17 Oct. 2015. Winter, Mark. "Krypton: Reactions of Elements." Krypton: reactions of Elements [WebElements Periodic Table]. The University of Sheffield and WebElements Ltd, UK, 1993-2015. Web. 17 Oct. 2015. "Krypton." Related Keywords & Suggestions. N.p., 2015. Web. 17 Oct. 2015. "Krypton Element Facts." Chemicool. Chemicool.com, 2015. Web. 17 Oct. 2015. "Common Compounds of Krypton Kr." ENDMEMO. Endmemo.com, 2015. Web. 17 Oct. 2015. "KRYP-TON." Rader's Chem4Kids.com. Andrew Rader Studios, 1997-2015. Web. 17 Oct. 2015. "Krypton (revised)." Chemical Elements: From Carbon to Krypton. 2006, "Krypton." How Products Are Made. 1999, Richard Mowat, "krypton." The Columbia Encyclopedia, 6th Ed.. 2015, "krypton." World Encyclopedia. 2005, "krypton." The Oxford Pocket Dictionary of Current English. 2009, T., and "krypton." Oxford Dictionary of Rhymes. 2007. "Krypton (revised)." Encyclopedia.com. HighBeam Research, 01 Jan. 2006. Web. 17 Oct. 2015. Deshpande, Amruta. "Facts about Krypton." Buzzle. Buzzle.com, 31 May 2010. Web. 17 Oct. 2015. Parsons, Paul, and Gail Dixon. The Periodic Table: A Visual Guide to the Elements. New York, London: Quercus Editions, 2013, 2014. 88-91. Print. Gray, Theodore W., and Nick Mann. The Elements: A Visual Exploration of Every Known Atom in the Universe. New York: Black Dog & Leventhal, 2009. 92-93. Print. "Verify CGC Certification." CGC Certification Verification. Pedigree Comics, 2015. Web. 17 Oct. 2015. M., Robert, and Lucas W. "Krypton The Flashing Element." YouTube. YouTube, 12 Feb. 2012. Web. 18 Oct. 2015. ​"Images Of Chemical Elements." Images of Chemical Elements: A Virtual Museum. N.p., 2015. Web. 17 Oct. 2015. ​"Krypton." Pictures, Stories, and Facts about the Element in the Periodic Table. N.p., 2015. Web. 17 Oct. 2015. Articles written by LWR. © Copyright 2015, All Rights Reserved.